After graduating high school in Richland, Washington, Chloe Milliken knew she wanted to enlist in the U.S. Army—and she wanted to be on the front lines. It was 2013 and she was given the same options women who wanted to serve in combat had at the time: become an Explosive Ordnance Disposal Technician (EOD) or join the military police (MP). To her, the choice to be an EOD technician was clear. Milliken, whose father served as a sergeant in the Army, was stationed at Ft. Drum near Watertown, N.Y. and was assigned to the 754th Ordnance Company. While stateside, Milliken and her company worked with the Secret Service providing security at events attended by former President Barack Obama and Vice President Joe Biden. They also supported local police departments that didn’t have a bomb squad. She deployed as a part of Operation Enduring Freedom (OEF) to Kandahar Provence of Afghanistan from September 2015 through July 2016. While on a mission in February 2016, Milliken and her team hit an improvised explosive device (IED) and had to be medically evacuated to a U.S. military hospital in Kandahar. Within a week however, Milliken and her team went back into the field. Milliken received the Combat Action Badge and the Army Commendation medal. “I was really lucky to have great team who was knowledgeable and who could handle anything,” says Milliken. 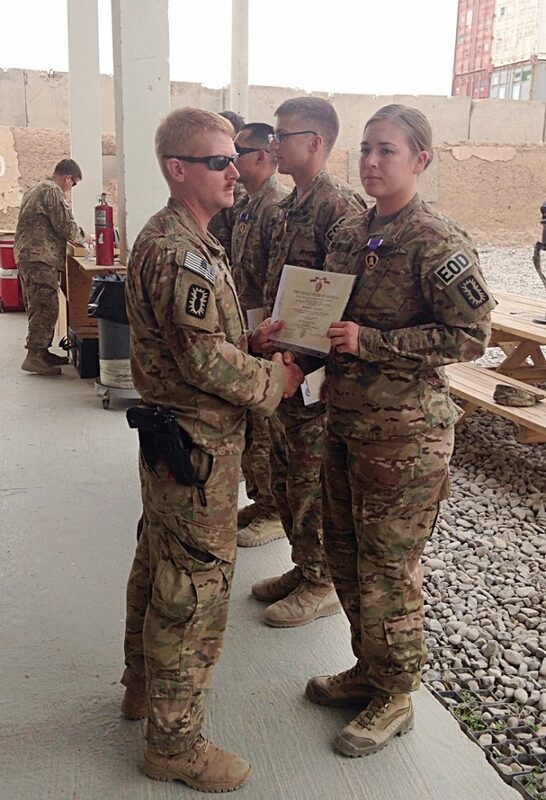 For her service, Milliken received the Combat Action Badge and the Army Commendation medal. She also received a Purple Heart, making her one of only a few women to ever receive the award. “This recognition was a long time coming. Women have been serving as EOD techs since WWII. It’s incredible to see in my lifetime the change in acknowledging women in combat and the change against the common misconception that women weren’t in combat roles,” Milliken says, referring to the 2016 decision to open all combat jobs in the military to women. 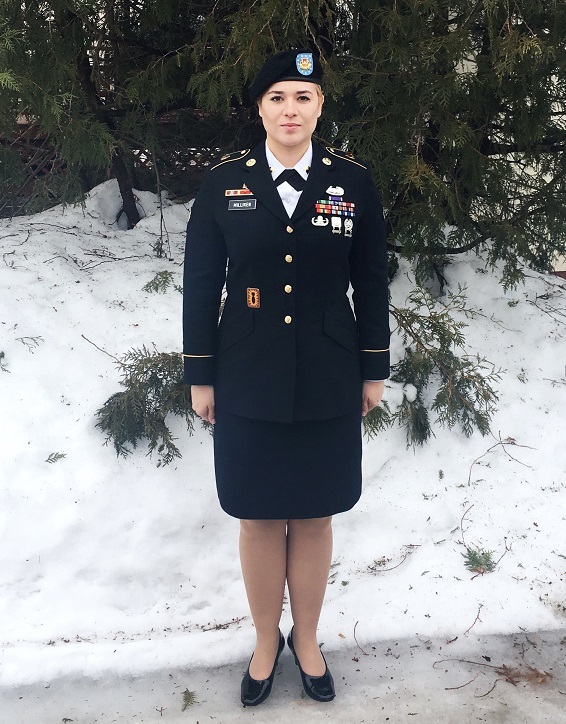 Returning to civilian life in 2017, Milliken was considering college options that would have taken her further away from her partner who is still stationed in Fort Drum. 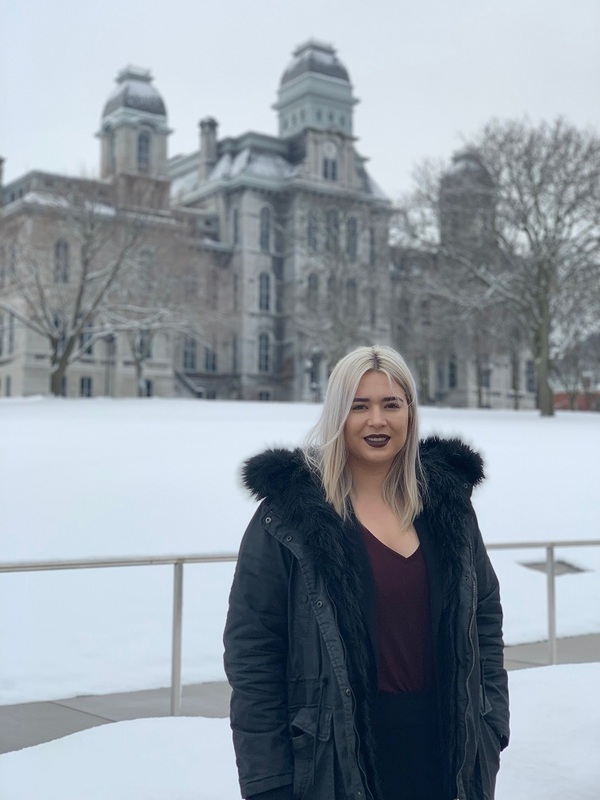 After touring Syracuse University, Milliken found a college that would support her as well as place her closer to her family. “The support and commitment to veterans is unlike any other college that I’ve seen,” Milliken says. Working in Syracuse University’s Veteran Career Services office, Milliken witnesses this support first-hand. She got involved with the office after a trip to New York City during her freshman year, where student veterans met and networked with top employers. Milliken says opportunities like these helps break down the gap between veterans and employers—allowing veterans transitioning into civilian life to show the intangible skills they honed in the service. Now a political science major in the College of Arts and Sciences and the Maxwell School of Citizenship and Public Affairs, Milliken will graduate in May 2019 and has already secured a position with the Department of Justice in Washington, D.C., pushing toward her goal of becoming an FBI special agent. She urges incoming student veterans to embrace the veteran community and support on campus despite the common, initial tendency to put some distance between their military and civilian experiences post-service. “You put yourself at a disadvantage when you don’t interact with a network of other individuals that want to support those goals and those interests of establishing a civilian life,” Milliken says.